The Takeaway: Fashioned from a series of lectures and essays penned by May, a psychotherapist who was intensely interested in the creative process, this book is a meditation on what it means to be creative. Filled with stories and insights from May’s own career and his work with artists, it is not so much a practical guide as it is a deep pondering of what creativity is, and why it matters. The Review: I’ve been drawn to this book since 1985, when I was a junior in high school and stumbled upon it at my local public library. However, it wasn’t until recently that I was able to sit down and absorb what May had to say about the creative process, the factors that influence it, and the artist’s role in society. May wrote this book in 1975, in the midst of all sorts of social upheaval, and on one level, his words and examples are constrained by that time period – there are lots of references to the stifling influence of the governments of the Soviet bloc, although he rightly observes that America and other capitalist nations have their own factors that limit creative expression. What’s refreshing about “The Courage to Create” is that May, who considered himself an artist, does not approach creativity from a deficit or pathology-based perspective. He doesn’t suggest (as some psychologists in his day supposed) that creativity is a compensatory reaction to deficits in a person’s personality or other inadequacies. He also does not focus on mental health issues that do occur frequently in artists (depression, anxiety, bipolar disorder, etc. ), choosing instead to discuss difficulties in an artist’s life in the context of the often arduous journey that is traveled as a creation goes from initial idea to finished artwork. One of May’s themes, threaded throughout the diverse chapters, is that true creative activity is an “encounter,” one that forever changes the artist. Without this encounter, he argues, our creative output will be dry and lifeless. 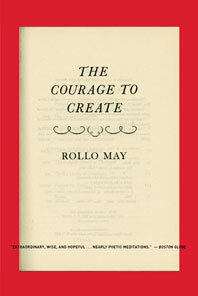 Despite the depth of its subject matter, “The Courage to Create” is a short book of less than 150 pages. May’s storytelling ability makes it a quick read, and his historical accounts of artists and other creatives, blended with his personal narratives and those of his artistic patients, give a verisimilitude to the volume that mere theorizing would not accomplish. While it was published years before the advent of the personal computer or the Internet, the book reads in a surprisingly contemporary manner – a sure sign that May tapped into the elements of the creative process that are eternal, and eternally interesting.